156" x 156" x 115"
Accessories Included: Cool Wave Slide, two swing seats, ring/trapeze combo bar, climbing wall, telescope, and picnic table with awning. Ready for Fun in the Sun? 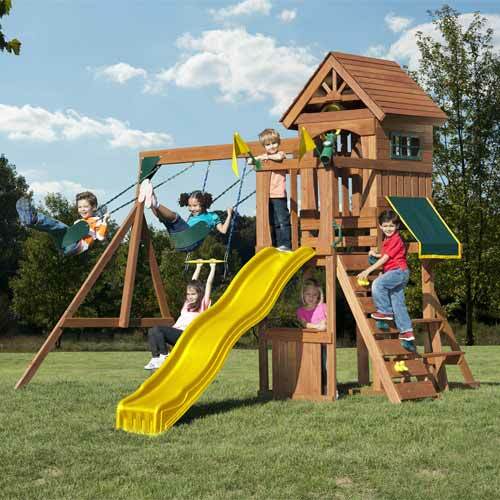 This ready to assemble swing set adds a lot of fun to your backyard. 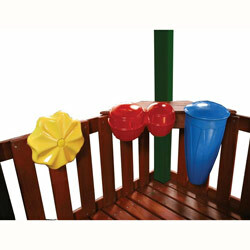 With a fun slide, 2 swings, a trapeze bar, climbing wall, telescope and picnic table with awning, your kids and their friends will spend hours playing on this set. Whats great about this set is that everything you'll need for building is included.